Welcome, Student, to Air Temple Arts School of Levitation and Legerdemain! You are cordially invited to participate in our 2nd Annual HOUSE CUP! Who: The House Cup is open to all Air Temple students who will be participating in adult session classes, open studio, and private lessons at any point over the course of the two summer sessions. What: A friendly competition amongst students for excellent prizes, culminating in a Tri-Wizard Field Day at the end of the summer. When: The House Cup will for the approximate duration of the first summer session, May 1st – June 23rd! Take the new official Pottermore Sorting Hat Quiz (www.pottermore.com) and email a screenshot of their house to info@airtemple.com (or show Stacey in person), and pay the $10 registration fee. If you participated last year we already have your house but we still need $10 for prizes and such! All students will participate for their Given house! To determine the winner of the house cup, the accumulated points will be divided by the number of students in the house. For example, last year Hufflepuff had the most accumulated points, but Slytherin won, having the highest average points/person. Points can/will be award/subtracted by any active Air Temple Professor (coach) at their reasonable discretion. To ensure fairness points can only be awarded a max of five at a time excepting extraordinary feats. Points will be subtracted for: Negativity and complaining, excessive or habitual lateness, preventable sloppiness and bad technique/habits, and arguing with Professors about points. The winning house will receive ATA House Crest Shirts in their color. Unless Slytherin wins again, then we have to figure something else out. DON’T LET SLYTHERIN WIN. Do you have to be a Harry Potter fan to participate? OF COURSE NOT! The House Cup will be super fun whether you’re a super fan or not! 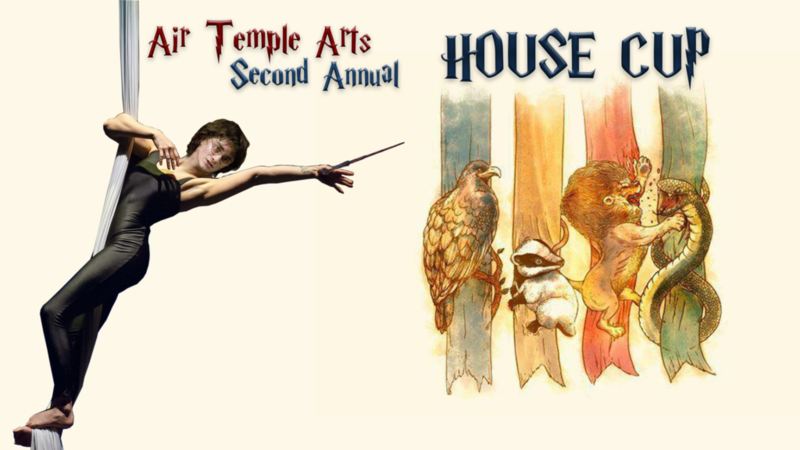 The House Cup is now open to ALL Air Temple Students, including youth. The Tri-Wizard Tournament (which will be not at all dangerous at all) will be on FRIDAY JUNE 23rd and include wizardly feats of strength and smarts and also quidditch. Yes, we have a system in place to prevent cheating. Don’t even try it; hexes are my specialty.